Israeli leaders in Samaria were horrified to learn this week that Israeli leftists with the Yesh Din organization took part in an Arab celebration on the ruins of the Jewish community of Homesh. During the celebration Jewish symbols at the site were replaced with PLO flags, and a banner was waved that depicted a man in religious Jewish garb with a spear through his mouth. Yesh Din was instrumental in causing the celebration as well. The group’s lawyers filed the lawsuit that lead the government’s legal adviser to declare that the government would transfer Homesh to Arab hands. Acting head of the Samaria Council Yossi Dagan – who himself was expelled from Sa-Nur, near Homesh – was appalled to hear that Yesh Din had been at the rally. “The extreme left has hit an unbelievable low,” he said. There were people at the celebration rally who called to murder Jews, he noted. “We’re used to incitement and even libel from extreme-left organizations. But even for an extremist group like them, this crosses a red line, and brings them to depths I wouldn’t have dreamed they would reach,” he continued. “I’m trying to picture how they have the audacity to seek donations from Israelis on the one hand, and to participate in anti-Semitic rallies where people call to murder Jews on the other,” Dagan said. In contrast to the group’s self-definition as a peace-seeking organization, “the security situation is likely to deteriorate due to its activities and provocations” in the region, he warned. He called on the government to take a strong stance on the matter by stripping Yesh Din of its NGO status. Yesh Din gets roughly 94% of its funding from foreign sources, among them the European Union. In 2012 the group got over 1.1 million shekels from the EU, 1.2 million from the Norwegian foreign ministry, 120,000 from Holland’s embassy in Israel, and 120,000 from the British Foreign Ministry. (Editor’s note. Yesh Din is supported and funded by the New Israel Fund. The Palestinian Authority also played a troubling role at the rally. 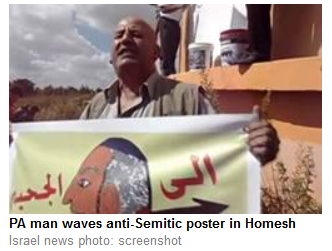 One of the men who held up the anti-Semitic poster depicting a dead Jew has reportedly been identified as Samir Dausha, a senior PA legal official in the Shechem region. Yesh Din director Haim Erlich admitted that the group had representatives at the Arab rally in Homesh, but denied that the overall tone of the rally was anti-Semitic. It is beyond me how any Jew could celebrate the dispossession of Jews and the giving away of Jewish land during the ever on-going war to the enemy; that is treason, pure and simple. How any Jew who witnesses a sign depicting the murder of a Jew can claim that it is not antisemitic reflects on that Jew’s sanity and identity. How Israel can tolerate a High Court that denies justice to Jews by accepting undocumented claims of enemy aliens shames Jews and justice. But how the New Israel Fund *NIF) can claim to be pro-Israel and pro-democracy when it funds a gang that legally and morally supports Jew hating enemies of the Jewish nation state is incomprehensible in any way other than that the NIF is hypocrital and treacherous. Niether Yesh Din nor the NIF has a place in the House of Israel and Jewish legislators and rabbis should proclaim that.